Midnattsol’s latest album, The Aftermath, is to be released on the 25th May 2018 via Napalm Records. This is huge news for Midnattsol’s fans as it is the band’s first release since 2011 as they decided to take a creative break. This is also the first release featuring Liv Kristine Espenæs sharing the microphone with her sister Carmen Elise Espenæs. Liv Kristine is best known for being the former frontwoman of Leaves’ Eyes and Theatre of Tragedy. It was announced that Liv would be joining the band as a permanent member in December 2017. The Purple Sky opens with a combination of folk-inspired melodies across piano and guitars before exploding into distorted guitars and fast double pedal drumming. The combination of folk-style melodies running through the lead guitars supported by heavier tones is an expected feature of the symphonic metal genres. The vocal lines are very gentle – Liv’s vocals are famously soft and gentle as shown in her previous musical works. Carmen’s vocals also display a similar tone. The two vocalists merge well together. The slight differences in their vocals adds more definition to the vocal parts. However, at parts during this track, their vocals appear lost in the mix; the instrumentation occasionally overpowers the sister’s voices. This is an enjoyable track but a stronger track could have been used to open the album. Syns Sang is much more energetic than The Purple Sky. The instrumentation also has more depth and the vocal lines are more prevalent. Both Carmen and Liv display more of their vocal range – reaching higher pitches and sustaining notes for longer periods throughout the track. The heavier tone to the guitars creates a darker mood in the track. Vem Kan Segla further develops the dark theme by opening with storm sound effects and a cawing crow. This creates a dramatic gothic atmosphere. The vocal line opens with instrumentation gradually building up. This track draws heavily off folk styles. The sister’s vocals harmonise wonderfully and are prevalent in the mix. The folk inspired spectrum of the symphonic metal genre is where Liv’s vocals are established. The writing style of Midnattsol definitely suits her voice. Herr Mannelig is a much heavier, darker track. Opening with heavy, minor distorted guitar chord sequences. The sound builds up with haunting piano melody and fast percussion in the mix. This track is very dramatic and conveys a dark gothic atmosphere. Carmen’s voice is haunting, supported by a calming piano melody. The build-up of distorted guitars adds further depth to the sound without over powering the vocal line. Growling background male vocals contribute to the heavier tone of the track. The alternating of full, heavy parts and softer parts creates an effective contrast throughout the track, without losing the dark mood. Evaluation Of Time begins with a calming, serene melody. Halfway through the track, heavy distorted guitars begin to build up. The gradual build up creates a dramatic effect. Folk influences are prevalent through the melodies in the guitars. This instrumental track adds variety to the album. The arrangement of melodies and chords across the instruments works effectively to create an atmospheric track that suits the style of the rest of the album. Forsaken opens with an acoustic guitar chord progression. The bass melody, strings and vocal line complement each other and present the folk influences in a different style to other tracks on the album. A melody line in the electric guitar is introduced further into the track. This adds a heavier tone without clashing against the acoustic guitar chords. Eitrdopar, the bonus track on the album, is the shortest track on the album, with the combination of melodies in the instruments and harmonies in the vocals coming together effectively. Once again, the folk influences are very prevalent. The marching-style drums create a strong sense of movement throughout the track. The tracks on this album explore dark, gothic and folk influences in different ways and to different degrees. The mixture of English and Norwegian lyrics adds variety to the songs. The varying interpretations of folk influenced symphonic metal presented on this album illustrate the band’s understanding of song writing and this genre. The addition of Liv’s vocals adds an extra dimension. The return of the well-rested Midnattsol combined with the power of the two sisters will certainly make an impression in the symphonic metal realm. 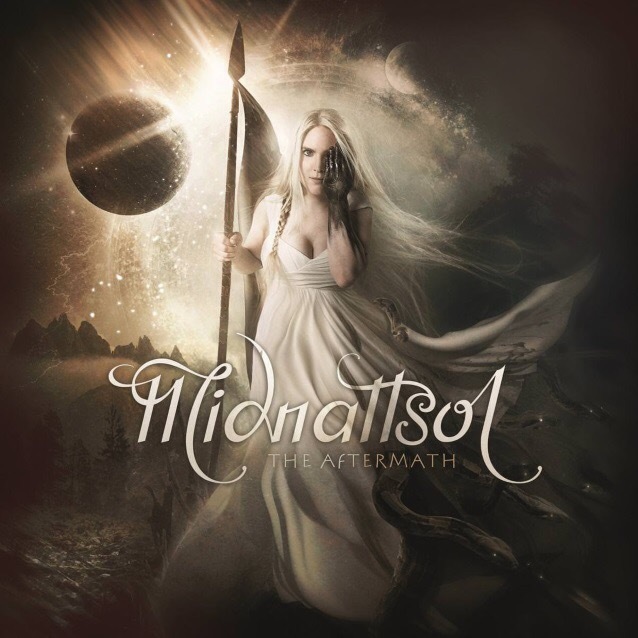 ‘The Aftermath’ by Midnattsol is released on 25th May on Napalm Records.